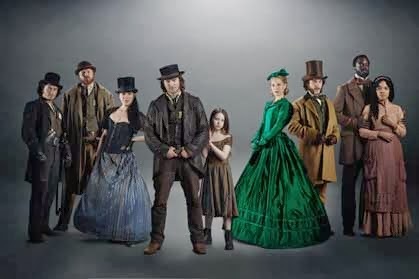 The cast of BBC America's "Copper." Copper was not a perfect television show. Let’s start with the obvious — the BBC is not exactly the ideal company to produce an epic drama of the Irish. So, when news broke last week that Copper had been cancelled despite being one of its network’s highest-rated shows, it was a little more than tempting to see the Union Jack maneuvering to sink the green, white and gold yet again. But to give credit where credit is due, there were more than a few explicit denunciations of the Brits on the show. Irish characters regularly laid blame for the Great Hunger, and for centuries of oppression, at the feet of the Brits. Oh sure, there were still critics. Some were aghast that the lead character was played by a Brit/Welshman, Tom Weston-Jones. Others objected to the show’s depictions of the Irish. Nevertheless, the (flawed) hero of the show was an Irish immigrant, even if his accent tended to shift like the breeze off of the Atlantic in downtown Manhattan, not far from the Five Points neighborhood where the show was set. If you want to tell the story of the Famine Irish without confronting crime and drink, well, good luck with that. Meanwhile, though Tammany corruption was central to the show (especially in the just-completed season two), the most corrupt characters on the show were native-born Americans, many of whom were clearly anti-Irish and anti-Catholic. Ultimately, Copper was a solid drama. It never rose to the elite heights of cable drama occupied by the likes of Breaking Bad and Mad Men. Copper tended to lack the psychological depth and complexity which made these shows so compelling. That all being said, Copper was a damn fine show. And an important one. As we continue to stumble our way through immigration reform, too many people still believe America has only had to confront issues of immigration and assimilation since around 1960 or so. Copper challenged that misconception. TV generally shies away from dense, complicated, historical realism. Bravo to Copper for informing, as well as entertaining. Copper boldly drew comparisons between our past and present, and contained important lessons for people who consider themselves both liberal and conservative on the issue of immigration. Here’s what liberals could learn from Copper — the Irish were discriminated against, probably much more virulently than anything today’s immigrants face. And religion was central to their ability to lift themselves up from abject poverty. Here’s what conservatives could learn from Copper — government (even when it’s as corrupt as Tammany) can help those in need. Furthermore, if rural Irish Catholics could (eventually) assimilate in 19th century New York, then today’s immigrants will probably have no problem doing the same. Copper also helped undermine misconceptions peddled by smart folks who should know better. Michael Barone, a fellow at the American Enterprise Institute, has a new book out this week called Shaping Our Nation: How Surges of Migration Transformed America and Its Politics (Crown Forum). Barone has some interesting insights on the Irish. But then he offers this up. A “knack”? As in, it just came naturally? As Copper made very clear, the Irish turned to politics because they’d had every other door slammed in their face. And this “knack” for politics was developed only after years of great struggle against nativists. TV is really the ideal forum for a long-form immigrant saga. But, as the Irish in Copper know all too well, you have to take what you can get.